Join the Miller Family and their big-hearted crew during the 71st season of Elkhorn Ranch guest ranching in sunny Arizona. We hope you will be in touch to arrange a visit between November 13, 2016 and April 23, 2017. 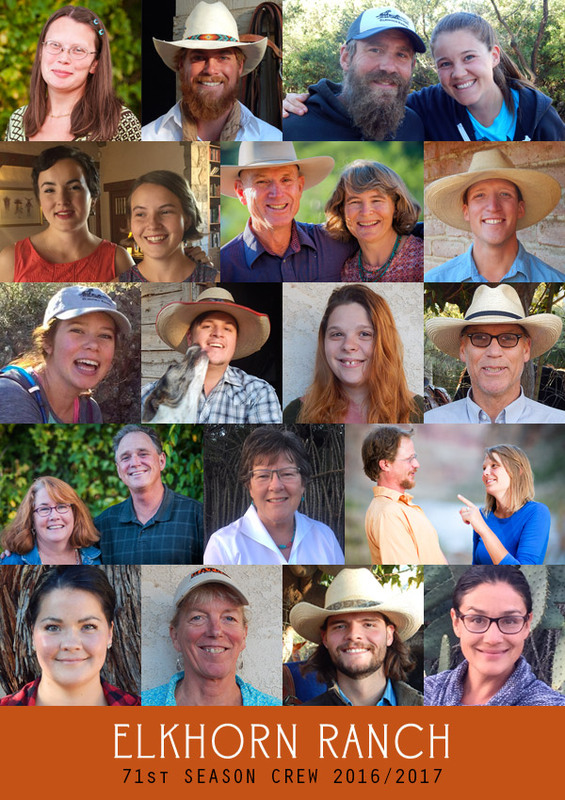 Our talented crew will take care of you at meals at the Long House, keep you cozy and comfortable in our cabins, lead you high into the mountains and out into the desert on horseback rides tailored to your interests and needs. There are a few spots free for the holidays, music and digital photography workshops in January 2017 and winter time adult oriented weeks. Reduced rates are available for 2 and 3 plus week long visits! School holidays are family time at Elkhorn Ranch — a great place for a multi-generation family gathering! Join us this next season! Elkhorn Ranch Crew starting top left to right: Cara, Corey, Craig & Grace, Clara & Alicia, Mary & Charley, Dave, Hailey, Hunter, Jaime, Jim, Anne & Tom, Diane, Jerome & Bayley, Kiki, Lynn, Ethan, and Tara.